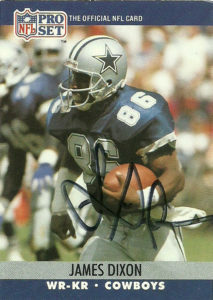 James is notable as he helped rookie Troy Aikman break the NFL rookie passing record (at the time) with 203 yards receiving, including that 75 yard bomb. He also set the club mark with his 1,181 kick off return yards, breaking the mark previously set by Mel Renfro back in 1964- all in his rookie season. Still he’s fallen into relative obscurity over the years and lives comfortably in Texas. 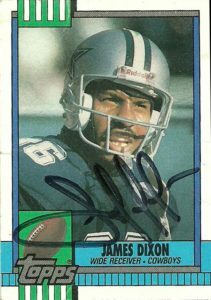 James Dixon was quite lucky. 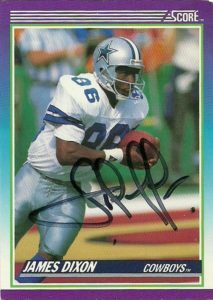 He played on a terrible Cowboys squad, but stuck out enough to get noticed before he faded off into obscurity. It was enough that 4 major brands (Topps, ProSet, Score, and Action Packed) all put out cards of him. 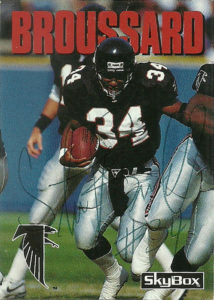 After returning to the hobby, I was surprised that he didn’t appear in any lists on websites or any fans were clamoring for his address, so after many years, I decided to go ahead and do some sleuthing and figure out where he was at. He did not disappoint, signing these 3 cards in under a month. 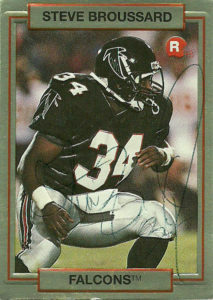 Steve Jordan went to college at little known football school Brown from 1978-1981. As a Junior he finished 5th in the league in receiving, but but gained real recognition as a Senior when he posted 38 receptions for 693 yards and earning numerous awards. 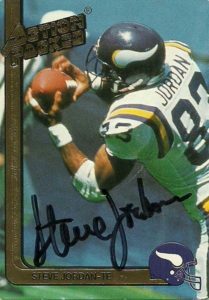 Jordan made enough of an impression that the Minnesota Vikings drafted Steve in the 7th round of the 1982 NFL Draft. He’d initially bide his time on special teams and work his way up from 3rd string. After 3 seasons, Steve finally was named starter at tight end. He’d go on to start every game over the next 10 years. During that period he also established himself as a dependable go to man, pulling down 3 or more passes a game during the 150 game stretch. 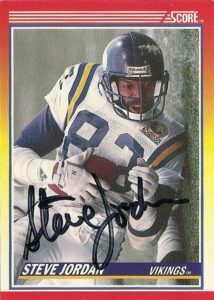 Steve was definitely ahead of his time in an era when tight ends were more relied on for blocking than their receiving skills. 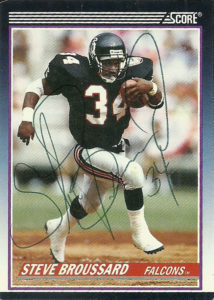 Over that period Jordan appeared in 6 Pro Bowls, which is more than HOF greats: Jackie Smith, Ozzie Newsome, Kellen Winslow, Dave Casper, John Mackey, and Mike Ditka. Oddly Steve has not received any HoF considerations. As of 2017, he is the Vikings All-Time receiving leader at tight end. 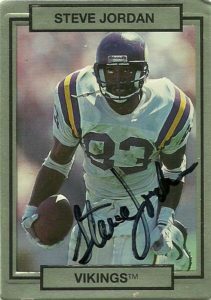 Steve played for the Vikings through 1994, but as age and injury took their toll, he opted to retire from the sport. Steve moved to Arizona where he has been involved in engineering and construction. He’s also involved in numerous sports initiatives bringing education, and healthy lifestyle building to Native Americans. Steve’s son Cameron, also plays in the NFL for the New Orleans Saints. Steve had a plethora of really nice cards to choose from and it was hard to just choose three, when there was probably 6 to 7 that really merited consideration. His Score 1990 issue is among my favorite of all time. It was genius by the designer at Score to take this shot of Jordan and flip the naturally composed photo to a portrait. As a landscape image, it probably wouldn’t have worked at all. In general there are few shots from any set like this with the turf set up parallel to the player. I am a huge fan of Action Packed, and both his 1990 and 1991 issues. The 1991 in particular is clean and I love how they were able to get the team logo on the front. The photo of Jordan making that fingertip grab really showcases the hands that made him one of the most reliable tight ends of the 80s and early 90s. 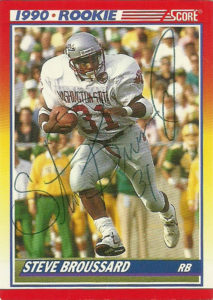 A mainstay of the Tecmo series, Steve was a solid receiver on the Minnesota offense.